I have several outdoor time-lapse projects running, of which the long-term time-lapse project at Port Newark Container Terminal has been running for the longest – about 3 years by now! 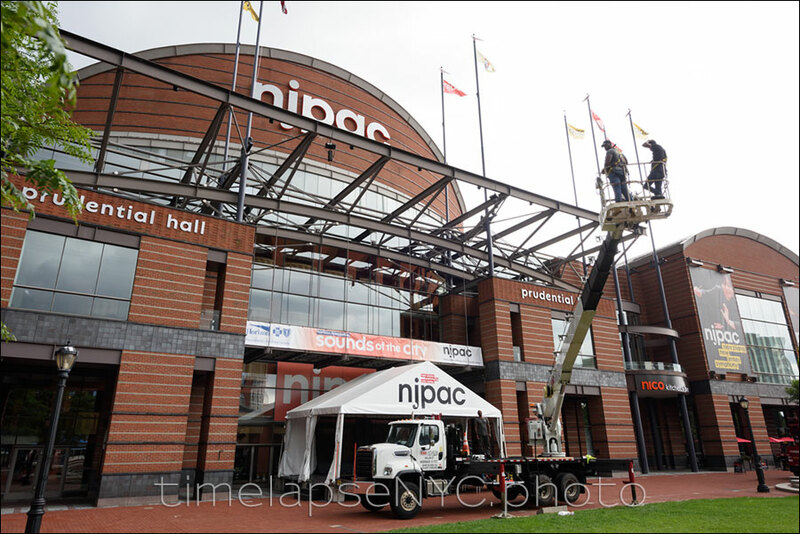 Long-term timelapse need not be that long though.Here is a time-lapse installation that I set up for NJPAC to record the final step in their rebranding transformation – replacing the large letters of their logo in front of the NJPAC building. 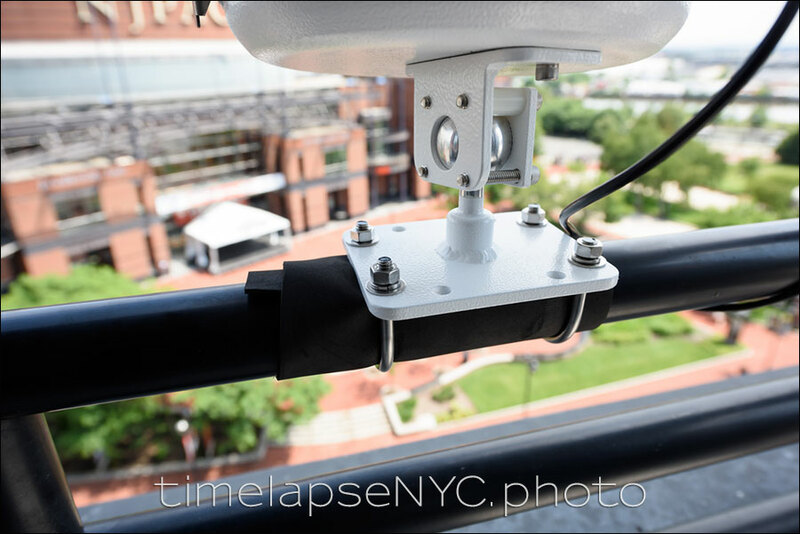 This time-lapse project ran for 3 day, and since the camera would be mounted outdoors, it had to be in a weather-proof housing. As you can see in the video, there were constantly strong winds, and there was even a rainstorm on the final day. So the weather-proof housing was essential. The entire project took 3 days because the two cranes had to meticulously work around the railings that are part of the building’s facade. 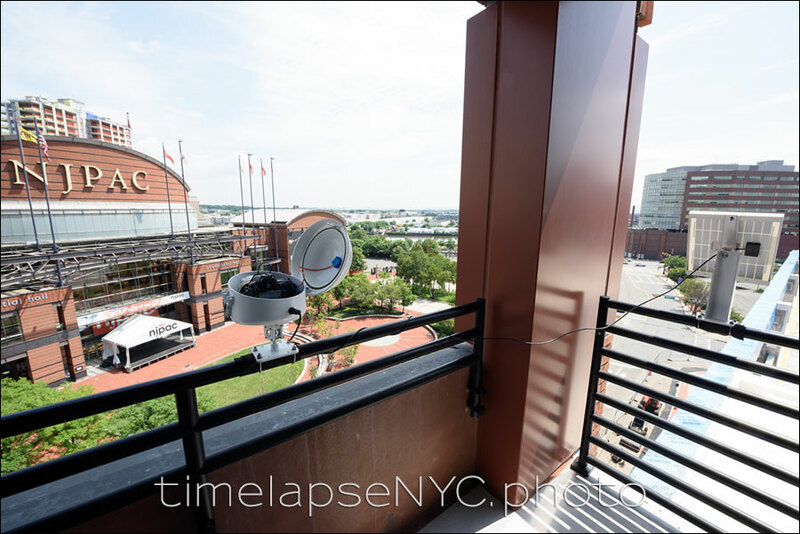 This is where time-lapse photography comes to the fore – condensing the project into a much shorter time-span where you can see the transformation. The camera inside the weather-proof housing. The camera has a timer, and runs off a battery. The battery is recharged through a solar panel, which is shown in the extreme right-hand side of this photo. 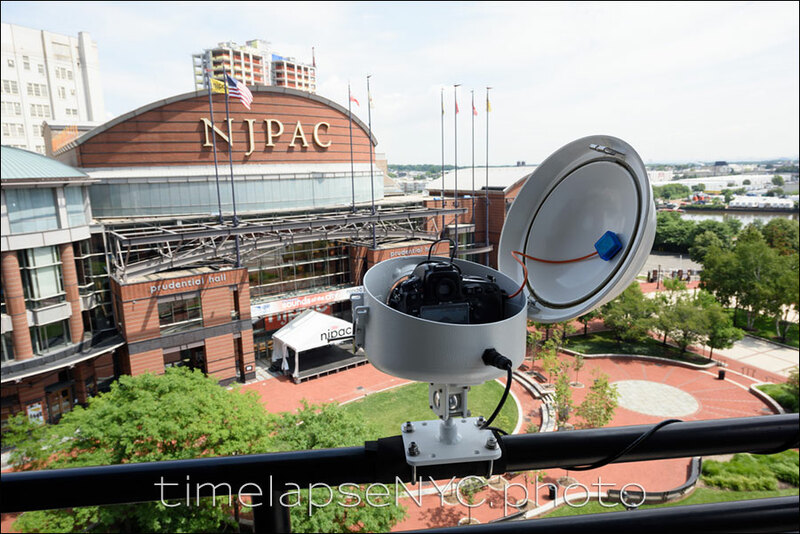 The property manager of the building where we mounted the camera across the street from NJPAC, was concerned that the camera mount and the solar panel mount don’t damage the brand-new railing of the apartment. I therefore took care to sufficiently pad the mount so that there wouldn’t be any marks on the railing. One of the two cranes that were involved in removing the letters from the building, and then hoisting the new logo up, letter by letter.